A livery badge, or heraldic badge as it is also called, is a distinctive badge usually worn by retainers and household servants indicating their allegiance to a particular lord. This particular badge comes from the late medieval period. It is the device of Arthur Prince of Wales, the son of Henry VII and brother of Henry VIII. 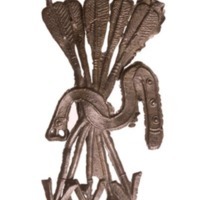 It depicts five arrows held tied together by a belt. Two of the arrows are blunt, and three are pointed with barbed tips that were typical of medieval hunting arrows. It is 60 mm in length and made of lead. The badge is very plain and made of a fairly cheap material, indicating that it was probably worn by one of the Prince’s servants or retainers. It was excavated at Bull Wharf, Upper Thames Street in London, and is currently on display in the Museum of London. 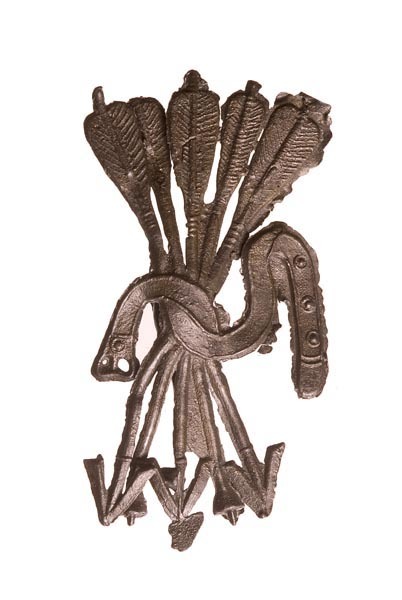 “Livery Badge,” Medieval London, accessed April 22, 2019, http://medievallondon.ace.fordham.edu/items/show/78.